Near field communications chips (NFC) are used to create a smarter active stylus and make possible novel applications. Intel engineers are working to develop a next-generation active stylus, one that eliminates the need for a battery to power it and uses NFC as the core component. Some of the issues surrounding active styli — according to Shwetank Kumar, director of touch engineering within Intel’s human interface technology group — are batteries running out of charge, lack of consistency between stylus manufacturers, and proprietary stylus technology tied to a single type of device. “I think the pen is a very important aspect of the user experience on tablets, which has so far been largely ignored or slapped together through some combination of what ecosystem players have been able to do themselves,” says Kumar. Intel's development of new forms of styli came out of its work on embedding NFC technology into PCs. "Typically, NFC-enabled devices like tablets, kiosks and computers are destinations," says Anand Konanur, a senior radio frequencies engineer within Intel’s PC Client Group. In a PC, the 4 cm by 6 cm NFC coil is typically placed on the back of the display. Konanur and his team realized that users wanted to tap their NFC devices directly against the screen and not on the back of their computer. Fortunately, the trend by display manufacturers is to replace metallic deflector sheets used to maintain brightness with non-metallic sheets. NFC coils can be placed directly within the layers of the display. 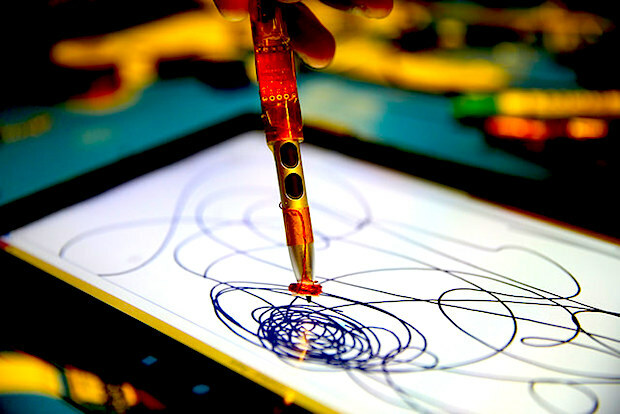 Once Konanur and his team had NFC friendly displays they set out redesigning active styli, by stripping out much of the circuitry and the battery. NFC allows the stylus to draw power from the coil in the display. “We started off trying to replace the battery just to make it cheaper and also to let this anxiety from people go away that they will lose their stylus in the middle of something important and that it will get discharged,” says Konanur. “How do you know that you will always obtain power as required?" NFC-powered styli are also greener — no battery to make and recycle, and the design could become an open standard used application developers and industrial designers. There's also space inside the stylus space to add sensors and microprocessors that could make it into more of a stand-alone device.